C342 Pointe du Grand Gouin. 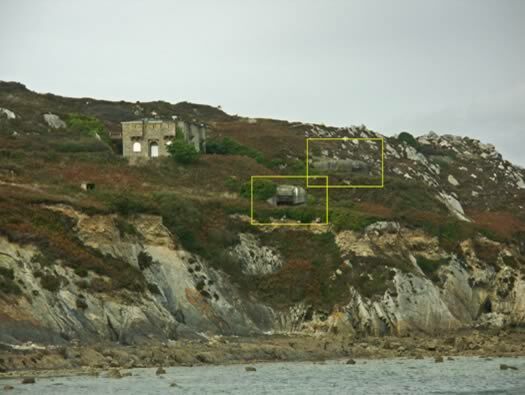 C342 Pointe du Grand Gouin, H.K.B 1274 is situated on the west coast of Crozon peninsular of Brittany and covering the important port of Brest where a large U-boat pens were constructed. 4 x 220 mm K532 Schneider models 1917 (f). 4 x R668 small six man bunker. 2 x R671 7.5cm C/97 Schneider. 2 x 7.5cm assault guns. 4 x Maxims in the FCP. 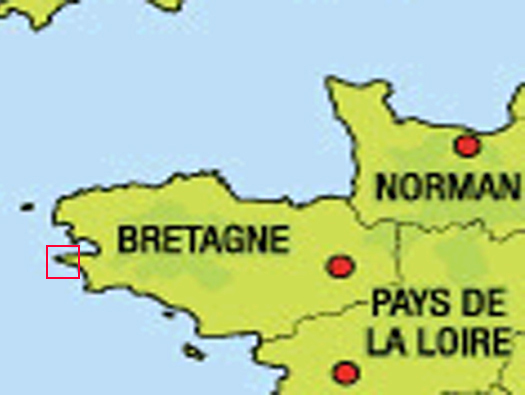 C342 Pointe du Grand Gouin, H.K.B 1274 The Crozon Peninsular sticking out into the Atlantik. Pointe des Espagnols, a French pre war batteries. C342 a new German army battery. C346 an French battery with a German battery super imposed over the French one. Cap de Chevre covering the Baie dr Dournenez another naval battery. 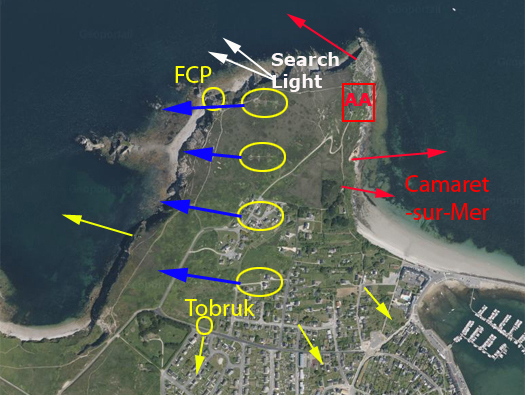 C342 Pointe du Grand Gouin, H.K.B 1274 The battery is to the west of the small town of Camaret-sur-Mer a lovely little fishing port with good cafe's and restaurants. 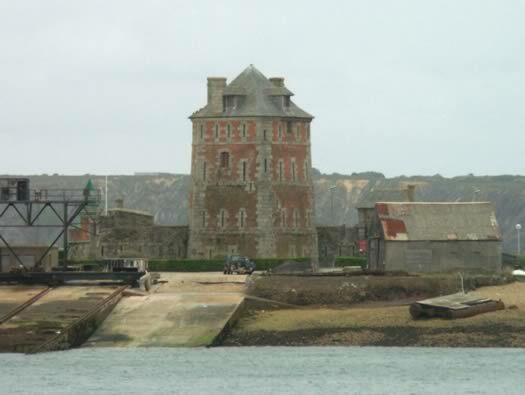 Tour Vauban de Camaret sur Mer. C342 Pointe du Grand Gouin, H.K.B 1274 View from the town towards Point Grand Gouin. A French fort Corps de Garde. This type are common all around the Brittany. There were also 3 x 7.5cm K. M/97 Schneider on pedestals two in R671 casemates. 670 casemate for medium pivot guns 90deg. Area covered by the three guns. C342 Pointe du Grand Gouin, H.K.B 1274 4 x Geschutzstellung (open emplacements) for the 22cm guns. 4 x Protected positions with 22cm K.532(f) Schneider Mie 1917 with construction starting in late 1942 on a virgin sight. A Heer (army) battery H.K.B.1275, crewed by 200 men. The range of the guns was about 22km. 22cm K.532(f) Schneider Mie 1917. 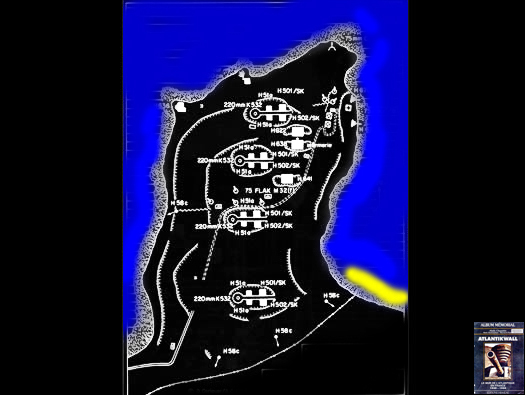 Plan of one of the emplacements. Yellow arrows - Tobruk machine guns. Red arrows - 7.5cm guns. Attached to the battery were five 7.5cm M32(f) AA guns three 2cm Flak 30. Three 7.5cm K/97(f), one to fire star shells and the other two inside casemates protecting the port of Camaret. 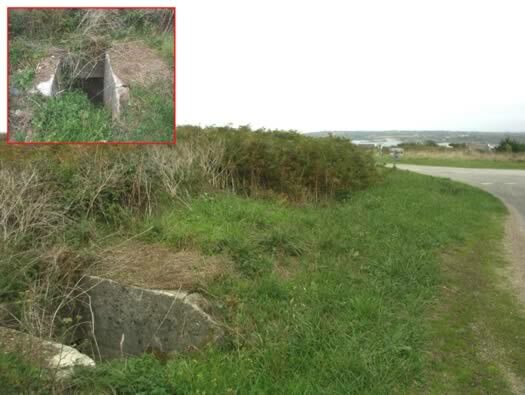 Vf51 a half group shelter, enough for half the guns crew..
C342 Pointe du Grand Gouin, H.K.B 1274 Vf58c Tobruk. One of the four Tobruk's this one is on the roadside. R636 command post for Heer's (army) battery. 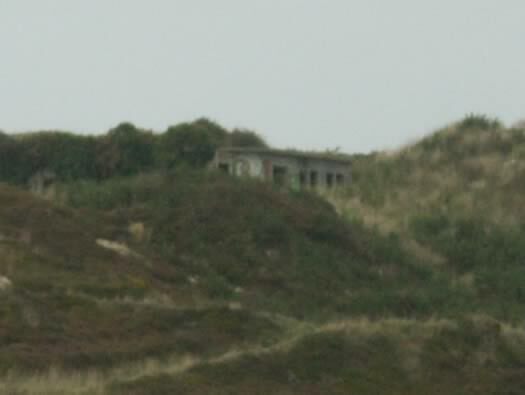 This photo was taken just over the hill from the battery position and looks like some of the barrack buildings? R636 sat on the cliffs.